It's a WTF moment. A headline in an online newspaper alerts me to a culinary phenomenon I have never tasted much less heard of and as the combination of salt, sugar, fat and gawd knows what else amounting to a four alarm get the paddles cardiac arrest sinks into my brain, I can feel the twinge of my pharyngeal reflex wanting to automatically respond with horrified disgust. Yes, folks. 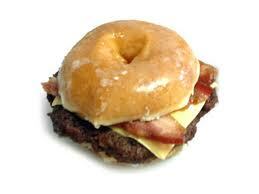 It's a hamburger that uses two Krispy Kreme donuts as the bun. Apparently this gastronomic monstrosity was pioneered in the southern United States and popularized by one Paula Deen of the Food Network. According to various newspaper articles, it seems this all-in-one hamburger slash dessert has become something of a hit at various fairs. Experts seem to differ on the exact numbers, but I'm seeing calorie counts of a thousand to fifteen hundred. A single Krispy Kreme glazed donut has 250 to 300 calories depending on the source of nutritional information so consider your count is starting from 500 to 600 just because of the donuts. Now go ahead and add the burger, the eggs and the bacon. Geesh, just how much salt is in all of that? It used to be the recommended daily intake of sodium was 2400 milligrams but as of last December, various health experts had reduced that to 1,500 milligrams per day. I am confident that just one burger will blow all of our diets right out of the water and then some. A few years ago, on a lark, I stopped in at a Wendy's to have a Baconnator just so I could brag to the family I had managed to eat one. Afterwards, I looked it up on the Internet and discovered just one of these over the top hamburgers contains 1,920 mg of sodium. Holy saltshaker. Do we have any idea of what we're putting in our mouths? The predecessor to this dubious edible invention seems to be something called the Luther burger. The urban legend has it that singer Luther Vandross was one day making burgers and discovered he didn't have any hamburger buns so substituted donuts. An article on Snopes.Com says this is conjecture but the story lives on as the origin of this unusual combination. You can supposedly whip this one up in 15 or 20 minutes. Obviously you can drastically cut down on meal times as you are eating your main course and dessert at the same time. This is truly "fast food". Use a large mixing bowl to mix the ground beef, chopped parsley and grated onion together. Use the House Seasoning to liberally spice up the concoction then form 3 hamburger patties. Spray a large cast-iron skillet with a non-stick cooking spray then heat it over a medium-high burner. Put in your burgers and cook until the desired temperature. Four to five minutes per side should do it for medium-rare. Fry up your bacon until crisp. Remove strips and drain them on paper towels. While your burgers are cooking, heat a non-stick pan over medium heat then add 2 tablespoons of butter. Crack the three eggs into the pan then cook them until the yolks are slightly set but still runny. Place a couple of slices of cheese on the burgers at the last minute to slightly melt the cheese. Lay out your doughnuts as buns and place your cheese-topped burger patties on them. Top each burger with 2 pieces of bacon and a fried egg. Serves three people. Make sure there is a fourth person in the room who is capable of operating the defibrillator. Final word? You want a final word? How about I'm going to barf? Oh... my... gawd...!!!! *laughs uproariously* What people eat never fails to amaze me. Good lord, can anybody make something to eat which has your recommended daily caloric intake in a single sandwich? Wait! What am I talking about? This probably exceeds your recommended daily caloric intake. Holy freak-out! Usage notes: This is a stereotypical phrase in "valspeak". The 'dialect' spoken by stereotypical Californian valley girls.